Iranian President again criticizes US sanctions against his country, says they amount to "a terrorist act". 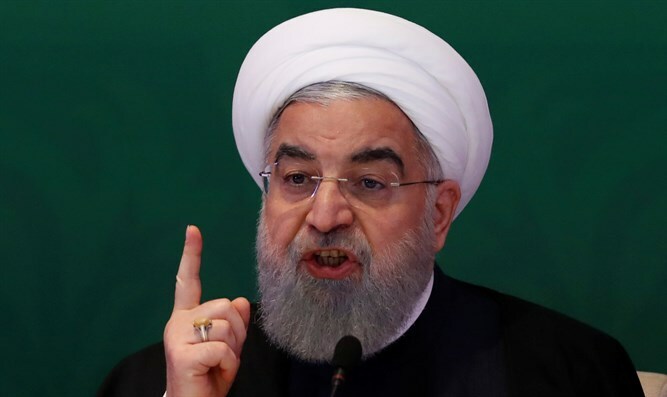 Iranian President Hassan Rouhani continued on Wednesday to criticize the US for reimposing sanctions on his country, saying the sanctions amounted to "a terrorist act", Reuters reported. US President Donald Trump withdrew from the 2015 Iran nuclear deal last May and reimposed the sanctions that were frozen as part of the deal, causing Iran to feel the pressure. "The struggle between Iran and America is currently at a maximum. America has employed all its power against us," Rouhani was quoted as saying in a cabinet meeting by the state broadcaster IRIB. "The US pressures on firms and banks to halt business with Iran is one hundred percent a terrorist act," he added. In December, however, Rouhani said US sanctions against his country amounted to "economic terrorism". Earlier this week he described the US sanctions imposed on Iran as an economic war being waged on his country. Trump has reimposed the sanctions with the aim of slashing Iranian oil sales and choking its economy in order to curb its ballistic missile program, which was not covered by the 2015 nuclear deal. The US says that Iran’s efforts to develop ballistic missiles defy UN Security Council Resolution 2231, which enshrined Iran’s 2015 nuclear deal with Britain, China, France, Germany, Russia and the United States. Iran, however, denies its ballistic missile tests violate this resolution. Rouhani has stressed in the past that Iran will continue to produce missiles for its defense and does not consider that a violation of international agreements. Responding to France’s calls for Iran to stop its ballistic missile program, Rouhani said on Wednesday, "We want a constructive interaction with the world, but the countries that work with us should not have excessive demands. Iran is firm in its stance and will act based on its national interests."